SITU University proudly presents another quality Design Studio for our members! SITU-University is pleased to offer another educational opportunity, this time with SITU Member and special guest instructor, Miss Mary! This is sure to be a Design Studio in high demand. You will need to book early to reserve your seat. Wait-listing may wind up being an option. Brrrrrr, it’s cold outside and you’ve got nothing to keep you warm and cozy. If you’ve been feeling Winter’s Chill, SITU-U has the perfect solution for you. Our very own Mary Hafner-Laney is presenting this Design Studio. This wonderful gathering will cover from the late 18th century through to the 19th and early 20th. 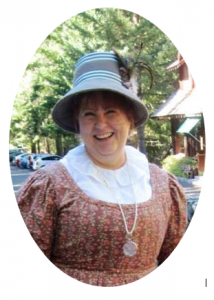 Mary will be bringing the pieces she has made as well as the antiques in her collection to show as examples. She’ll talk about commercial patterns, as well as drafting your own patterns, and things to consider when making a cape, cloak, or mantle. 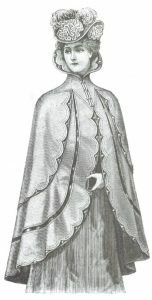 Mary will also provide scaled-down handouts of the pattern pieces of various styles of capes, cloaks, and mantles. This is sure to be a wonderful affair, informative with lots of practical tips and ideas, not to mention just plain fun. Mark your calendars to join SITU-U and Mary for this upcoming Design Studio! “South Sound.” Address and driving directions will be emailed to registrants . Finger food for the tea table. Beverages will be provided. Payment deadline is March 20, 2017.